Cloud Telephony means, you do not have to deal with telephony jargons, knowledge of how telephone works as long as you know what you want your telephone to do! Big data is now the key to business success. Businesses have to dig into the data very carefully to be able to stay healthy in the market. An entity working upon sensitive data should stay up-to-date with industry trends and always available to the required resources. As the importance and quantity of the data grew, the probability of data loss raised exponentially. Moving cloud communications is actively helping companies to grow faster and gain competitive advantage in their respective markets. It enables increased control and scalability of communications, the ability to deliver superior customer service and a healthier cash flow. Flood, fire or any kind of power outage can happen anytime. 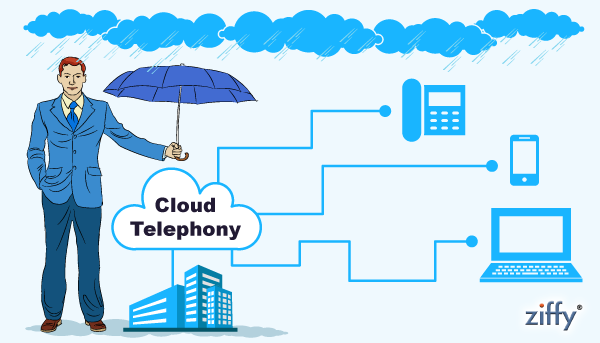 You need a telephony solution you can rely on and which will hold your business together during a difficult period, With Cloud Telephony solutions, all the critical elements are located physically on service providers’ network at different sites. This implies that critical functions such as voice mail, auto-attendant can be accessed from any remote location. If any serious environmental issue arises, phones can be connected to IP network from any remote location and business continues to stay normal. Ziffy offers you exhaustive network management that gives detailed documentation and helps to clearly understand network functioning which enables businesses to quickly resolve the issues. All hardware is maintained by the operator and there is a much lower amount of personnel needed to run the network. So, any kind of server failure or network issue can be easily identified and resolved. Business is all about how much trust is there between you and your client. Business clients, partners may lose trust in business if primary constraints are not met due to downtime. The organization may end up facing a lawsuit from unhappy customers. But Cloud Telephony solution enables businesses to access data in the cloud and ensures that reputation of the company is not degraded. Businesses are shifting towards Cloud Telephony, proven by the fact that there were more hosted seats connected in the first half of 2016 than there were for the entirety of 2015. A cloud telephony system makes a business lean and helps them to refocus on the areas of core competence.